The final five get a big surprise, and it's not just them all turning on each other. Their loved ones come to visit and compete in a luxury challenge of running through nets, balancing tiles on a machete, then placing the tiles in the correct pattern. For once Will is killing it in challenges, because seeing his wife is more motivating than anything else that's happened so far. But he stinks at balancing, which allows Mike to sneak in and win yet again. His reward is a day at camp with his mom, so she's gets the 4-1-1 on the tribe treating Mike like crap for weeks. 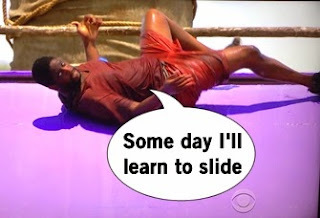 His other advantage is the ability to practice the next Immunity Challenge before all the others. 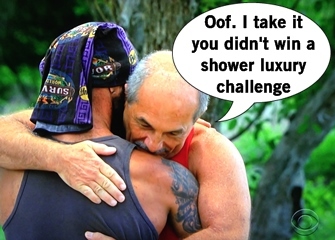 That Immunity Challenge is to navigate blindfolded through a maze to retrieve four necklaces (North, South, East, West) and being able to understand the course is a major advantage. Mike easily slaughters his competitors the next day, the group so desperate to take down Mike that they even try to help each other rather than security their own safety. Safe again, Mike holds a crucial role as the swing vote to decide who goes home. He suggests a final three deal with Carolyn and Sierra, aiming to eliminate Rodney. "He doesn't help around camp," Carolyn says like that even matters at day 37 of the game. Also, of course you bring Will because he's useless. But Mike is still hustlin', approaching Rodney and Will to take out one of the girls. Rodney insists the girl are fake, becoming Mike's BFF just to advance their game. Sierra is the only person who can upset Mike in challenges, which makes her an obstacle to Mike making it to the end. So at Tribal Council, Sierra defends herself saying she's a good competitor and deserves to be here because she tries hard. Will points out that if Mike loses the next immunity he'll definitely be voted out. With winning forefront on his mind, Mike chooses his side and eliminates Sierra from the game. The last Immunity Challenge is a real doozy that serves some Legends of the Hidden Temple realness. The survivors race up a huge flight of stairs, retrieve a key, slide down a baller water slide, then maneuver through obstacles to get puzzle pieces which they'll eventually assemble. The challenge is beyond exhausting and it's shocking someone didn't require medical attention with the heat and dehydration. Good news is at least we can relive Will's ability to belly flop like no other. To no one's surprise, Mike finishes the challenge first and wins immunity again, securing his spot in the final three... but who will he take with him? Well there's obviously two votes coming Carolyn's way from Rodney and Will. Despite turning his back on the prior deal he made, Mike truly wants to bring Carolyn to the final three. He wants to force a tie, which would send Carolyn and Rodney to a fire-making tie-breaker challenge. Carolyn tries to practice fire-making on the side while the other two lay around. 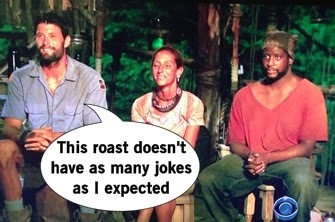 At Tribal Council, Mike plays it off like maybe it's not smart to keep Carolyn but it's a ruse. The vote is split 2-2, sending us to a tie-breaker challenge and the first we've seen since Survivor: Cook Islands. In case you're wondering, we're all shouting at the TV in excitement. The firemaking begins rather lackluster as both competitors wear away at their flint quickly, requiring replacements. While Rodney gets the first initial large flame, he isn't able to sustain the height. Carolyn is slow and steady, building a fire that creeps up closer towards the rope. Carolyn's fire ignites the rope drops the flag first, securing her seat in the final three. 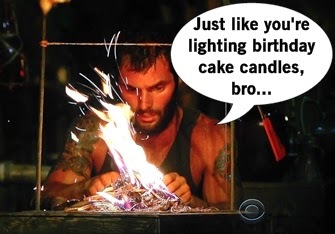 Rodney is eliminated, though maybe he would've made his fire better if it was igniting birthday cake candles. It's finally day 39 and the final three of Mike, Carolyn, and Will share their celebratory breakfast together. Fallen comrades probably happens, but offscreen since this finale is rushed on time. 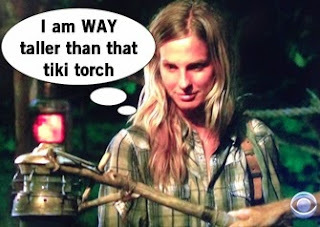 Final Tribal Council time! There are no opening speeches because, again, cut for time. It goes right into questions from the jury. First up is Joe who is that guy who says, "You've gotta earn my vote. No BS!" as if he'll change his mind from the speeches. Carolyn has to defend being a player in the game and not just being viewed as a mom, AKA the same thing that happens any time a middle aged woman makes the finals. Carolyn explains her power move included eliminating her ally Tyler, as well as eliminating Dan when her alliance turned on her. Rodney gives Will a shot to defend himself, who talks about making friends and sharing his snacks. Mike admits he sucked and maybe not as genuine as he thought he was. He also apologizes to Dan for what happened at the auction, and Dan sees this as a truly honest experience and forgives him. Jenn defends Mike and tells everyone to stop being so bitter and just vote for the guy who killed it all game. Bless you Jenn. But it's Shirin who steals the entire final Tribal with her speech which thanks Mike, calls him a howler monkey, Carolyn a stingray, and Will a dead fish that got dragged to the end, and a Sue Hawk quote. Oh and she's a millionaire already. DROP THE MIC, SHIRIN. Everyone casts their votes and Probst grabs the urn to magically time travel to present day and the reunion. The votes are read: one for Carolyn, one for Will, and the rest for Mike. 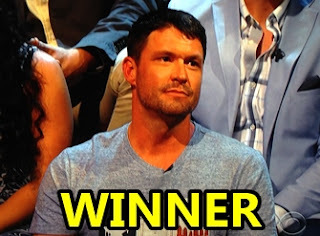 Mike Holloway is the winner of Survivor: Worlds Apart! A true underdog story since he'd been a target for weeks on end. But I mean, we've all seen this end coming for a long time, especially since Probst said we'd love the winner and most people on this season were abysmal. If you were hoping to hear from everyone on the stage, tough luck. Mike talks about the auction was his worst gameplay move and Jesus helped him. Rodney wears a dapper suit and finally gets a birthday cake. Probst confronts Dan accusations that the show edited him to be horrible by playing raw footage of the "your mother's a whore incident," then continues to drag him through the mud about his season-long crappiness. This Dan conversation goes on for entirely too long. It's then onto Will and Shirin. Will insists he apologized, Shirin says he didn't apologize until the public backlash, doesn't accept the on-stage apology Will gives to her and her family, and Will's wife is shouting from the audience like it's an episode of Springer. 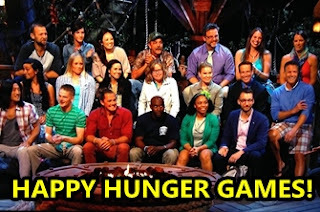 The finale wraps with the reveal of the cast of Survivor: Second Chance as Jeff Probst goes up to each candidate in the audience to shout, "You WILL getting a second shot!" or crushing dreams on television. A cast photo is taken and the 20 are whisked away to Cambodia for what I'm imagining will be the Hunger Games Quarter Quell IRL. And now what you're all here for: the pre-show winner prediction champions. I had my worst performance yet with So Kim and still nursing my wounds. 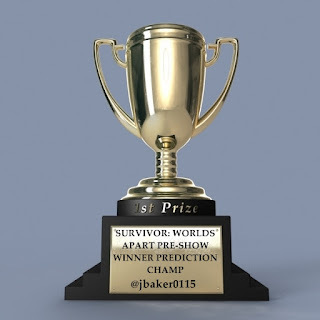 However five people had the brains to pick Mike to win and to them I award their [picture of a] trophy!